Arlington Non-insulated throat straight take-all connector of trade size 3/4-Inch, is suitable for use with 3/4-Inch knockout, NM, Flex, AC, AC90, MCI steel/aluminum jacketed cables and ACG90/Teck90 cable. 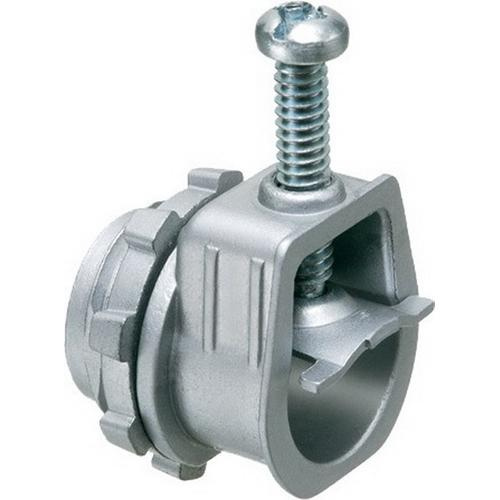 This connector features die-cast zinc construction. It measures 1.4-Inch x 1.75-Inch. Connector with single screw saddle connection, has thread length of 0.39-Inch. It accepts conductor of size 0.82 - 1.04-Inch. Connector is UL/cULus listed and CSA certified.